In practice, very few of the applied systems embrace all of these actions. In most cases, the release systems create constant concentration of drug within the body over an extended period of time. The assumption is that there is steady state drug levels in plasma and in target tissue or cells are correlated. Ideally, it is desirable to place the drug at the target, be it a tissue, a population of cells or receptors, leaving the rest of body drug free. Obviously this would be quite difficult, especially if the target is sheltered from systemic circulation by various barriers. For example, drug targeting to the brain via systemic administration is severely limited by selectivity of the blood-brain barrier.Figure 1 and 2 shows comparative blood level profiles obtained from administration of conventional, controlled, and sustained release dosage forms. The conventional tablet or capsule provides only a single and transient burst of drug. A pharmacological effect is seen as long as the amount of drug within the therapeutic range. Problems occur when the peak concentration is above or below this range, especially for drugs with narrow therapeutic windows. Indeed, prolonged release dosage forms reduce fluctuations in plasma drug levels by slowing down the absorption rate due to slower drug release rate. 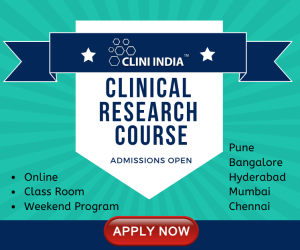 The term “sustained release” is known to have existed in the medical and pharmaceutical literature for many decades. It has been constantly used to describe a pharmaceutical dosage form formulated to retard the release of therapeutic agent such that its appearance in the systemic circulation is delayed and/or prolonged and its plasma profile is sustained in duration. The term “controlled release”, on the other hand, has a meaning that goes beyond the scope of sustained drug action. It also implies a predictability and reproducibility in the drug release kinetics, which means that the release of drug from controlled – release drug delivery system proceeds at a rate profile that is not predictable kinetically, but also reproducible from one unit to another. Delayed release systems are those that use repetitive, intermittent dosing of a drug from one or more immediate-release units incorporated into a single dose form. Example delayed release system include repeat action tablets, capsules and enteric coated tablet where timed release is achieved by barrier coating. Sustain release system includes any drug delivery systems that achieves slow release of drug over an extended period of time. If the systems can provide some control, whether this is of temporal or spatial nature, or both, of drug release in the body, or in other words, the system is successful at maintaining constant drug levels in the target tissue or cells, it is considered a controlled-release system. Site-specific targeting refers to targeting of drug directly to a certain biological locations. In the case of site-specific release, the target is adjacent to or in the diseased organ or tissue. Receptor targeting refer to the target is particular receptor for a drug within an organ or tissue. Both of these systems satisfy the spatial aspects of drug delivery and are also considered to be controlled-drug delivery systems. The usual goal of an oral sustained-release product is to maintain therapeutic blood levels over an extended period. The elimination rate is quantitatively described by the half-life. Each drug has its own characteristic elimination rate, which is the sum of all elimination process, including metabolism, urinary excretion, and all other processes that permanently remove drug from the bloodstream. Therapeutic compound with short half-lives are excellent candidates for sustained release preparations, since this can reduce dosing frequency. However, this is limited, in that drug with very short half-lives may require excessively large amounts of drug in each dosage unit to maintain sustained effect, forcing the dosage form itself to become limitingly large. In general, drugs with half-lives shorter than 2 hours are poor candidates for sustained-release preparations. Compounds with long half-lives, more than 8 hours, are also generally not used in sustaining forms, since there effect is already sustained. The characteristics of absorption of a drug can greatly affect its suitability as a sustained-release product. Since the purpose of forming a sustained-release product is to place control on the delivery system, it is necessary that the rate of release much slower than the rate of absorption. If we assume that the transits time of most drugs and devices in the absorptive areas of the GI tract is about 8-12 hours, the maximum half-life for absorption should be approximately 3-4 hours; otherwise, the device will pass out of the potential absorptive regions before drug release is complete. This corresponds to a minimum apparent absorption rate constant of 0.17-0.23 hours-1 to give 80-95% over this time period. The absorption rate constant is an apparent rate constant, and should, in actuality, be the release rate constant of the drug from the dosage form. Compounds that demonstrate true lower absorption rate constants will probably be poor candidates for sustaining system. The distribution of drugs into tissue can be an important factor in the overall drug elimination kinetics since it not only lowers the concentration of circulating drug but it also can be rate limiting in its equilibration with blood and extracellular fluid. One aspect of this distribution is binding of drug to tissue and proteins in blood. The apparent volume of distribution of a drug is frequently used to describe the magnitude of distribution, including binding, within the body. For design of sustained/controlled release products one would like to have as much information on drug disposition as possible but, in reality, decisions are usually based on only a few pharmacokinetic parameter, one of which is the apparent volume of distribution. Drugs that are significantly metabolized before absorption, either in the lumen or tissue of the intestine, can show decreased bioavailability from slower-releasing dosage forms. Most intestinal wall enzyme systems are saturable. As the drug is released at a slower rate to these regions, less total drug is presented to the enzymatic process during specific period, allowing more complete conversion of the drug to its metabolites. Formulation of these enzymatically susceptible compounds as prodrugs is another viable solution. For orally administered systems, there is an upper limit to the bulk size of the dose to be administered. In general, a single dose of 0.5-1.0 gm is considered maximal for a conventional dosage form. This also holds for sustained-release dosage forms. Those compounds that require large dosing size can sometimes be given in multiple amounts or formulated into liquid system. 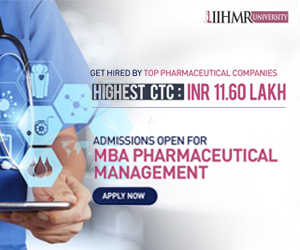 Another consideration is the margin of safety involved in administration of large amounts of a drug with narrow therapeutic range. Compounds with very low solubility (less than 0.01mg/ml) are inherently sustained, since there release over the time course of a dosage form in the GI tract will be limited by dissolution of the drug. The lower limit for the solubility of a drug to be formulated in a sustained-release system has been reported to be 0.1mg/ml, so it is obvious that the solubility of the compound will limit the choice of mechanism to be employed in sustained delivery system. Diffusional systems will be poor choices for slightly soluble drugs, since the driving force for diffusion, which is the drug’s concentration in solution, will be low. When a drug is administered to the GI tract it must cross a variety of biological membranes to produce a therapeutic effect in another area of the body. It is common to consider that these membranes are lipidic; therefore, the partition coefficient of oil-soluble drugs becomes important in determining the effectiveness of membrane barrier penetration. Partition coefficient is generally defined as the ratio of the fraction of drug in an oil phase to that of an adjacent aqueous phase. Accordingly, compounds with a relatively high partition coefficient are predominantly lipid-soluble and, consequently, have very low aqueous solubility. Orally administered drugs can be subject to both acid-base hydrolysis and enzymatic degradation. Degradation will proceed at a reduced rate for drugs in the solid state; therefore, this is the preferred composition of delivery for problem cases. For drugs that are unstable in the stomach, systems that prolong delivery over the entire course of transits in the GI tract are beneficial; likewise, for systems that delay release until the dosage form reaches the small intestine. Compound that is unstable in the small intestine may demonstrate decreased bioavailability when administered from a sustaining dosage form. This is because more drugs is delivered in the small intestine and, hence, is subject to degradation. It is well known that many drugs bind to plasma proteins with concomitant influence on the duration of drug action. Since blood proteins are four the most part recirculated and not eliminated, drug protein binding can serve as the depot for drug producing a prolonged release profile, especially if high degree of drug binding occurs. There are, however, other drug – protein interaction that have bearing on drug performance. Diffusion systems are characterized by the release rate of drug being dependent on its diffusion through an inert membrane barrier. Usually, this barrier is an insoluble polymer. In general, two types or subclasses of diffusional systems are recognized reservoir devices and matrix devices. Reservoir devices, as the name implies, are characterized by a core of drug, the reservoir surrounded by a polymeric membrane. The nature of the membrane determines the rate of release of drug from the system. It is also possible to use polymer coatings to achieve sustained release. 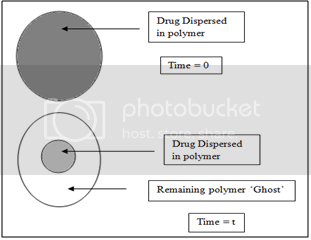 For this purpose the polymer itself should not dissolve, but rather should allow the drug to diffusion through the polymer membrane to the outside, in the case of oral drug delivery, into the gastrointestinal tract. Figure 3. Schematic representation of a reservoir diffusional device. A matrix device, as the name implies, consist of drug dispersed homogeneously throughout a polymer matrix. In the model, drug in the outside layer exposed to the bathing solution is dissolved first and then diffuses out of the matrix. This process continues with the interface between the bathing solution and the solid drug moving towards the interior, obviously, for this system to be diffusion controlled, the rate of dissolution of drug particles within the matrix must be much faster that the diffusion ate of dissolved drug leaving the matrix. Figure 4. 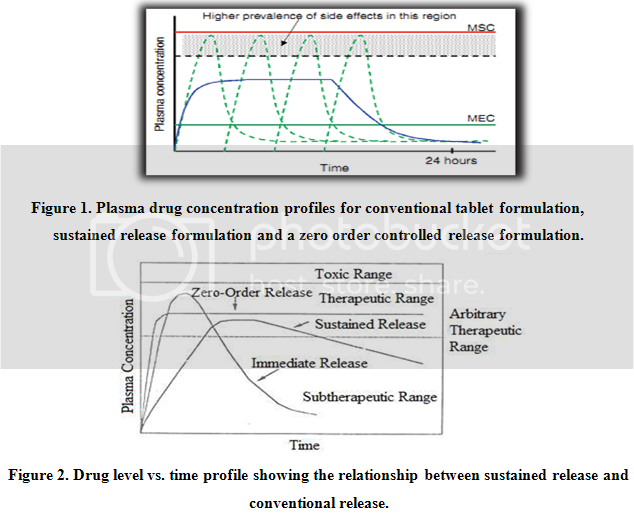 Matrix diffusional system before drug release (time=0) and after partial drug release (time=t). It seems inherently obvious that a drug with a slow dissolution rate will demonstrate sustaining properties, since the release of drug will be limited by the rate of dissolution. This being true, sustained-release preparation of drugs could be made by decreasing their rate of dissolution. The approaches to achieve this include preparing appropriate salts or derivatives, coating the drug with a slowly dissolving material, or incorporating it into a tablet with a slowly dissolving carrier. Figure 5. Two types of dissolution-controlled delivery system: (A) single bead type device with alternating drug and rate controlling layer; (B) beads containing drug with differing thickness of dissolving coats. Osmotic pressure is employed as the driving force to generate a constant release of drug. Consider semipermeable membrane that is permeable to water, but not to drug.When this device is exposed to water or any body fluid, Water will flow into the tablet owing to the osmotic pressure difference. These systems generally appear in two different forms. The first contains the drug as a solid core together with electrolyte, which is dissolved by the incoming water. The electrolyte provides the high osmotic pressure difference. The second system contains the drug in solution in an impermeable membrane within the device. Figure 6. Diagrammatic representation of two types of osmotically controlled system. Ion-exchange systems generally use resins composed of water-insoluble cross-linked polymers. These polymers contain salt-forming functional groups in repeating positions on the polymer chain. The drug is bound to the resin and released by exchanging with appropriately charged ions in contact with the ion-exchange groups. The free drug diffuses out of the resin. The drug-resin complex is prepared either by repeated exposure of the resin to the drug in a chromatography column, or by prolonged contact in solution.